Madrid is the capital of Spain and of the eponymous autonomous community. The satellite view below show the extent of the city center from the Palacio Real on the left to el Retiro on the right. Cutting the city in two like a river, the aptly named calle Mayor meets with the Puerta del sol after it grazed by the imposing Plaza mayor (another gigantic depletion in the layout of roofs after Sol itself), and continues afterwards now as the never ending calle de Alcala through the famous Cibeles. Less visible although much bigger, this pattern is repeated by the Gran Via in a northern branch of a Y. The two meet, again like two rivers, at a dull point overlooked by the Victoria Alada of the Metropolis building. The actual river, the Manzanares, grazes the western part of the city as it falls from the mountains, in the distant north. Madrid was funded by the muslims. It was then known as Mayrit, and was protected by walls circling what is today the neighbourhood of Palacio. 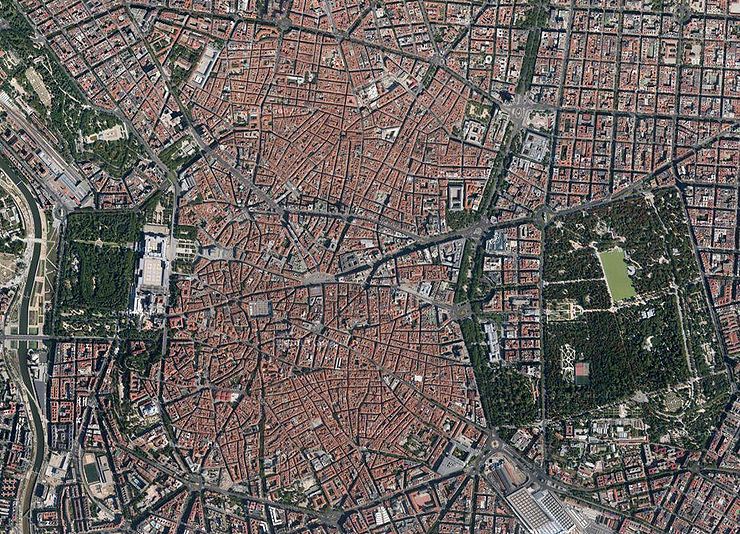 This is the central square of Madrid and, in a way, of Spain as a whole. 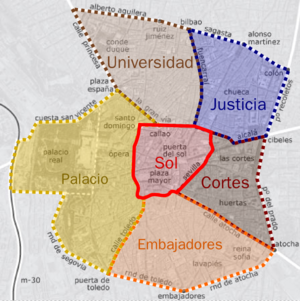 Most cities have their Plaza Mayor, With Salamanca ranking second for its specimen of importance and notability. From 1 January (2014), we lived in Plaza Mayor, on the side of the Casa de la Panadería. We no longer reside there but kept the flat as one of our most cherished possession. El Retiro is the west end of historical Madrid (nowadays surrounded from the further side by geometrical formations from modern urban planning). The name of this district comes from the famous park del Buen Retiro (of the good retreat). One everybody's favourite of the park is the monument to the Fallen Angel, that depicts the Milton's inspired fall of the brightest amidst the host of Angels. I like the work because of its ambiguity. The angel is represented as beautiful, while the fall itself is gripping, it seems eternal, never ending, always happening, a real kick from God. There is no angle that seems adequate, the statue falls in all the directions. I use it since 29 December (2013) as the decoration of my social network portals (google+, twitter, YouTube) as an acclaim to this equivocation that allows both satanic sects and devout catholics to both praise and despise the work: as a faithful representation of the Bible or as a tribute to the occult, the evil, the perdition. The former real casa de correos (post office), of New Year Eve's fame. It is now home to the Comunidad de Madrid after being the police headquarters under Franco's rule (Elena's father was incarcerated there for some short amount of time). The statue of Charles III dominating the place. The Kilómetro Cero, from which national highways are measured. The statue of the bear and the Madroño tree, the symbol of Madrid. La Mallorquina, a traditional pastry shop (since 1894). Their trufa de chocolate is Elena's family's favourite. Sadly, although we pass by there virtually everyday, it is for us only a transit point to take the train. The place is popular for all sorts of events and manifestations. la Puerta del Sol on Twitter. La Almudena, the cathedral of Madrid, consecrated in 1993 only. This is a new building because Madrid is a relatively new city, and when it grew to prominence, so did the Spanish empire, making Spaniards build cathedrals in the new world but not in their own capital. Iglesia de la Santa Cruz , . La Ermita de San Antonio de la Florida, fresco from and pantheon of Goya. The fantastic fresco of Goya picture in an early attempt of his revolutionary style a miracle of Anthony of Padua in the contemporary Madrid (instead of 13th century Lisbon). A beautiful square and the hub of Medieval Madrid, sitting between the Puerta de la Vega and Puerta de Guadalajara, the two main entries of the time . Parque del Capricho (pretty but far). [Cerro del Tío Pío], aka parque de las siete tetas, nice views for the sunset. Together they form the so-called Paseo del Arte. Casa museo de Lope de Vega (upon reservation/free). Museo Sorolla. On Elena's birthday 2013. Museo de la Fundación Lázaro Galdiano. Los mejores cocidos de Madrid. La Mariblanca as if impatient in front of the reloj de Losada en la Puerta del Sol. Elena and Tizón en la Plaza Mayor. Sunrise over the Plaza Mayor. Artists en la calle Arenal. Blossoming trees in the park La Quinta de los Molinos. Cutting a slice of grouper in the Mercado de la Cebada. The lights of la Gran Vía (on a day that was not that of the beast). Although with the Telefonica building, it seems the devil does live in Madrid. The crowded calle Preciados, by night. Church of the Santa-Cruz sitting on the rooftops. Elena and Julia in the Faro de Moncloa on 21 August (2018). 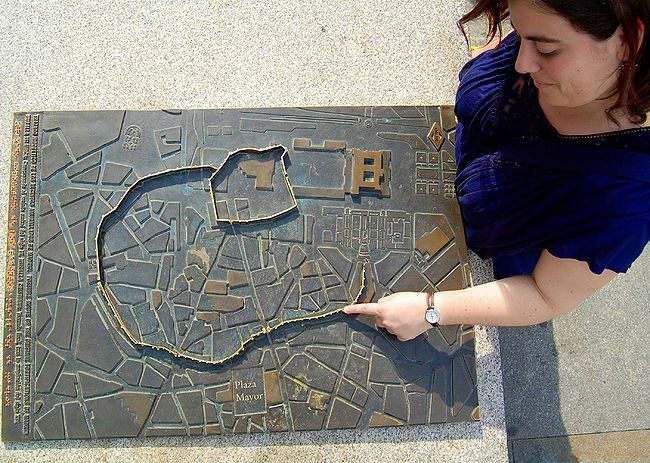 To do in Madrid (our todo list).